In the grand scheme of partying and parties everywhere, there has been a known epidemic occurring in most major cities. "Douchebags," they are everywhere. Infecting parties in their prime, sucking the life force out of events before they even reach their full potential. Well fear no more. Cat Face Party has arrived, at Webster Hall's infamous The Studio. The "Cat Face Party Motto"
Cat Face is the party where you draw a cat face on your face. Then we dance and drink and listen to dirty party music and have fun all night long. A cat face on your face makes you look hot, cute and ridiculous all at the same time. Douchebags don't like to draw cat faces on their faces. So there are no douchebags at our party. Cat Face is full of fun people who like dancing. We get good DJs. Even the DJs have to have Cat Faces on their faces. 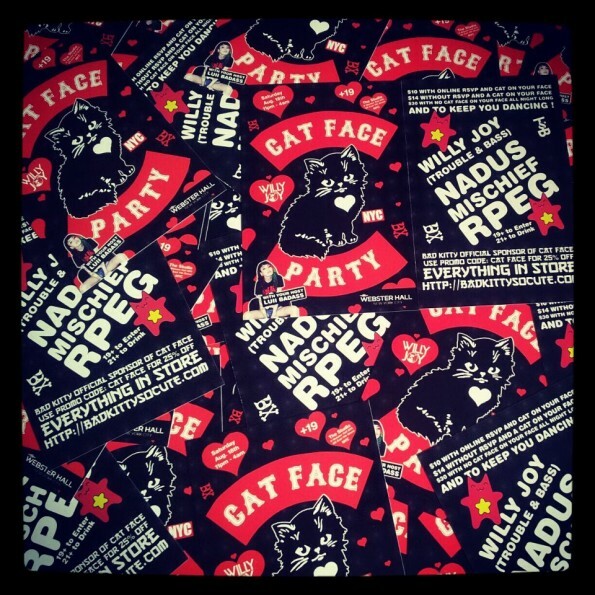 For this installment Cat Face Party has procured Willy Joy and Nadus, alongside Cat Face's resident DJs RPEG and Mischief, to shake the depths of Webster Hall on August 18th, 2012. I had the pleasure of DJing with Willy Joy atop a (not so legal) loft-space rooftop last season. The first location of our event was shut down by "you know who" (*cough cough*), so a few people and I arranged the second location at around 12: 30 AM. The hundreds of people from the first location took cabs to the second one and we continued on. Needless to say, it was a hell of a thrill and Willy Joy had people raging until we watched the sun come up. Recently, he started a track releasing series humorously dubbed "Free Willy Wednesdays", in which one track, that ranged from moombahton, moombahcore, to dubstep, trap, and all the way into glitch-hop, would be released every Wednesday (downloadable) for free on his Soundcloud. How generous, right? Otherwise, Willy Joy has been known for his intensity, charisma on stage, unparalleled connectivity with his audiences, and his releases on Trouble and Bass and Plant Music. He has also seen support from Crookers, Diplo, and BBC Radio 1. Nadus, oh Nadus. This guy has been and will always be "onto something." Most don't know this, but he is only 21. Yeah. Right? In that time he has already been a huge part of/backed by Brick Bandits, Body High, and NJRFSU. He produces and spins a rag-tag combo of Chicago juke, Jersey club, trap, and other assorted booty-shakin' genres. Nadus was featured on a recent installation of Boiler Room, a serious honorary performance to be had by any producer/DJ. I had the pleasure of hanging out with him at a recent Earmilk event that featured Sinjin Hawke, Egyptrixx, and N0ms, among others. On top of being a cold blooded killer in production and on the decks, he happens to be a downright damn good dude to chill/party/get way too drunk with. To enter to win a free ticket for you and your friend to Cat Face Party, tweet about this event and make sure to tag @earmilkdotcom and @RPEG1. Be sure to also include the date and location in your tweet! Winner will be announced via twitter 24 hours before the event.